Welcome to another edition of Screenshot Saturday and today we are doing a comparison between two blu-rays, both released by the same company, four years apart, both Razorback. The first blu-ray up is the 2014 release from Umbrella. For some reason, Umbrella released Razorback in the PAL format. "But there is no PAL format when it comes to HD. ", you might be saying. This is kind of true and kind of not. You see, HD comes in two flavors: 50hz and 60hz. 50hz is HD's form of PAL. There is the same speed-up if played on a 60hz television and the film's runtime is 4% slower than the one in 60hz. Razorback was released in 1080i50hz. This gave the image an interlaced look and feel because it was interlaced. The picture didn't look that hot, to begin with, but couple it with the interlaced format and the 4% speed-up and you have yourself a not that great blu-ray. 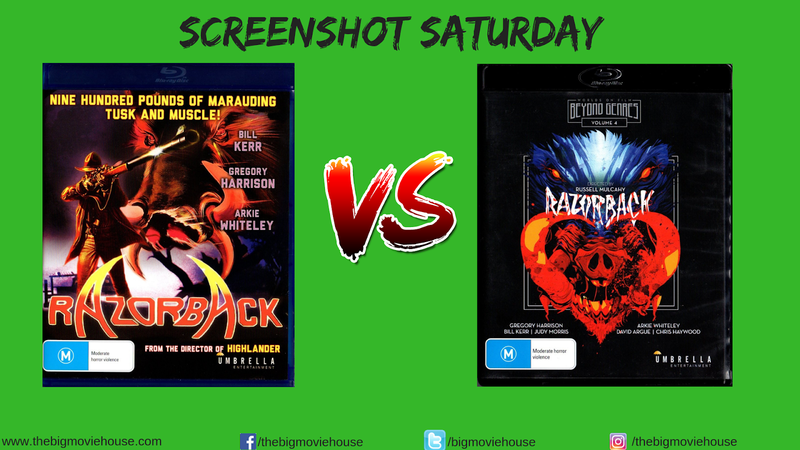 Being that this was the only blu-ray release of Razorback at the time, this was the best we could get. The second blu-ray up is the 2018 release, also from Umbrella. After years of Razorback fans voicing their distaste for the 2014 release, Umbrella went back to the source and did a brand new 4K scan of the film and the results are much more pleasing. Everything has a nice film-like feel to it and it looks like a brand new film. Ok, maybe not a brand new film, but it looks REALLY good especially when compared to the 2014 blu-ray. Needless to say, but the 2018 release is the winner here, by a long shot. Still, take a look for yourself.